If your Model I has been expanded with a so called DOUBLER its often really simple start with double density. Insert a switch on the DOUBLER of your Model I to switch between booting from the 1771 or the 1791 floppy disk controller. In most cases a flip-flop is being use to switch between activating the floppy disk controllers on your doublers board. 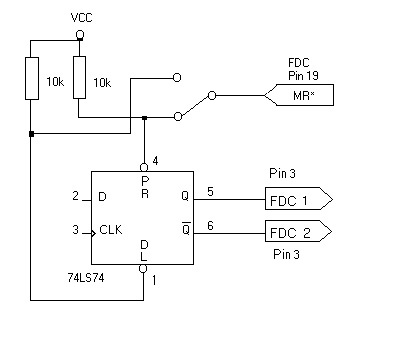 Detect which signals are being use by the flip-flop (74LS74) on your double density controller and place a switch between them. You should find a pair of pins 1 and 4 (or 10 and 13). Take two 10k ohm resistances and place them between pin 4 and 1 on the one hand and pin 14 of the LS74 (+5 V) on the other side. Take the switch and connect the middle contact with pin 19 of both FDC (RESET) and the other contacts with pin 1 (or 13) respectively pin 4 (or 10). Your DOUBLER will now startup in DD and your boot disk like the boot disk of a Model III may now have all tracks DD, while after switching your FDC will start SD as usual ( normal Model I mode). Just change pins 2, 3, 1, 4 to be 12, 11, 10 and 13 respectively if the flip-flop on your doubler uses these pins.